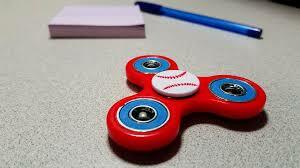 The Fidget Spinner is touted as a device to eliminate anxiety , the continuous movement generated by the person releases nervous energy, avoiding mental stress or even treats children with ADHD. Although the spinners were not originally created for therapeutic purposes. The person who patented this element was the engineer Catherine Hettinger, on May 28, 1993. Specifically, this spinner toy, initially had a design markedly different to that we know today. It was a type of circular mechanism molded from a single piece of plastic and its functionality is to turn on the tip of a finger, certainly the operation is the same. Catherine created the toy motivated by her serious condition called myasthenia gravis, an autoimmune disease that causes muscle weakness, which prevented her from playing with her young daughter. She thought about creating some element that could distract her and supply the playing time. Later, she traveled to Israel to visit his sister. While there he observed many young people who acted in violent ways among themselves and even with authority. Therefore, she began to think of devices that could distract children. First, it occurred to him to create a soft stone that the children could throw without causing damage, but then she changed his mind and developed the spinner . After creating it, she gave it to his daughter and some children of her family, really, were fascinated. When creating so many others, she decided to patent it at the beginning of 1993. She took it to several sales fairs, he also tried to sell them to toy companies. Indeed, he managed a meeting with Hasbro, one of the world's biggest toy manufacturers, but in the end the creator's offer was not approved. At the time, she managed to reach an agreement with local companies. Once on the market, the small toy gained great popularity. Catherine was really surprised, the fidget spinners were spinning on the fingers of hundreds of people of all ages. Although it was created and inspired by the children of Israel and their daughter, to entertain. In other words, the original invention was not intended to be relaxing but to entertain with little effort . It should be noted that the original patent does not have elements that speak of therapeutic uses to relax the mind. But, then it was used by adults for soothing purposes. Also, treat anxiety, depression, stress and even autism. The companies that commercialize it have been in charge of spreading and reaffirming this idea. Although, this has generated some dilemmas in authorship of the element. Catherine abandoned the patent in March 2005 for not paying the required annual fees. Now, companies can sell the product independently and without restrictions by the creator. Such is the case that Hasbro now sells them. Although, the creator expresses that there are certain differences between her own toy and the spinner fidget that are currently sold around the world. This device has such a popularity that it is in the list of the 10 best-selling toys, in Amazon, for example. This small object has moved hundreds of thousands of dollars. Each time there is more variety of spinner, because they have different colors and shapes that create attractive visual effects. There is even a spinner version with light, to shine in the dark. For children and adolescents, having a fidget spinner between their fingers, the more innovative the better, is a reason for popularity in schools, amusement centers and parks. The fame of this device is wide in countries like the United States, where most sales have been recorded. In Latin America, the spinner that arrived a few years ago has also been sold successfully, especially between 2016 and 2017. In countries such as Colombia. Now, we know that in the market day after day new creations are born or simply innovations of objects already created or patented. This is the case of the Spinner, which has been modified timidly by Takahiko Hasegawa, a champion of yoyo and Japanese representative of the company Soloham, ensures that this simple toy has been the star toy of the year 2017. If innovation is concerned, the Saturn Spinner, launched on the market in 2016, is presented as a marvel of modern engineering because it has the ability to spin continuously longer than any other spinner: approximately 12 minutes. Of course, to achieve this time depends on the ability of the owner. It has been nicknamed by fans as the "Rolls Royce of the Spinners", the Saturn Spinner was developed by a Japanese precision mechanics company, NSK, specializing in bearings for satellites. Its design is similar to a boat wheel, with heavy outer rings and a light aluminum ball joint in the center, which allows the centrifugal force to be extended.